After a two hour nap to regain energy lost during our overnight crossing of Anegada Passage, we are ready to begin our exploration of St. Martin. The island of St. Martin is divided into two distinct countries. The French side, including the capital city of Marigot, is on the north side of the island while the Dutch side is to the south. Most cruisers congregate on the French side because the clearance and port fees are less expensive. 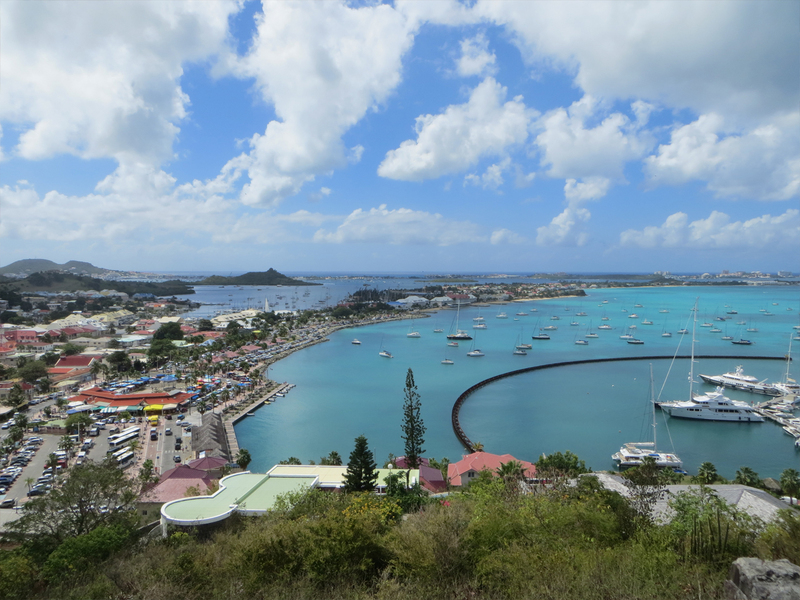 The big cruise ships call at Phillipsburg, the capital of the Dutch side of the island. St. Martin is a major yachting center. There are dozens of marinas, primarily catering to mega yachts. The local marine service industry is vast. Virtually any type of marine commodity or service can be found here. In fact, St. Martin is the general commercial nucleus of the Leeward and Windward Islands. Residents of other islands come here to purchase appliances and other big ticket items. There is no language barrier in St. Martin as local merchants speak both French and English fluently. The first step in clearing Customs in Marigot is a visit to the ATM machine to obtain Euros, which will be needed to pay our clearance and port fees. Then it is on to the Captainerie to clear in. The clearance fee is 35 Euro or about $50 which includes the first day of port fees for the privilege of anchoring in Marigot Bay. Thereafter, the daily anchorage fee is .25 Euro per meter times 15 meters or about $5.20 per day. These port fees are fair because they cover the cost of garbage disposal and access to dinghy docks throughout the French side. After clearing in, it is a short walk to the closest patisserie to sample the croissants. This routine quickly becomes a daily habit. 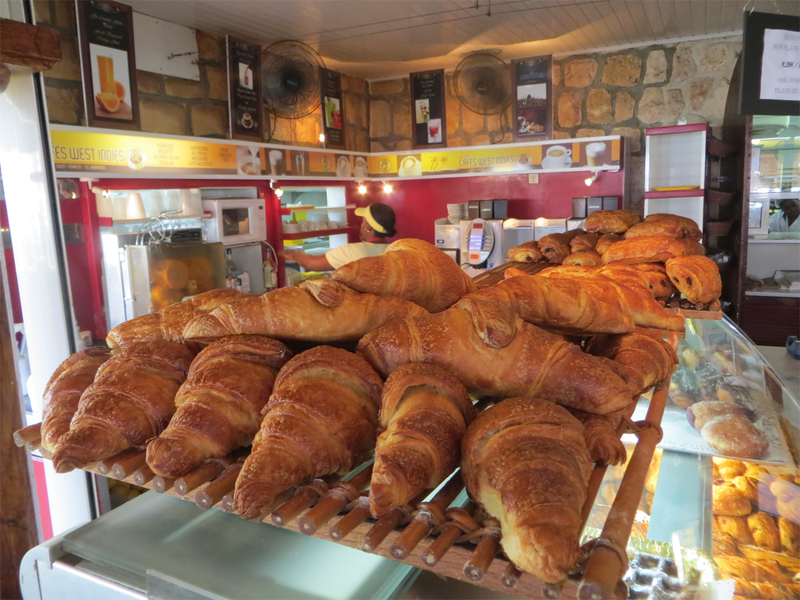 Boulangeries and patisseries are everywhere…a major advantage of being on the French side rather than the Dutch side of the island. The town of Marigot is a collection of small retail shops and kiosks that cater to the tourist crowd. Marigot offers an abundance of sidewalk cafes and restaurants, including French, Creole, Indian and Morrocan. From noon until 2 PM, most of the shops in town close while the restaurants and patisseries become packed with tourists who travel to Marigot via excursion bus from the cruise ships in Phillipsburg. 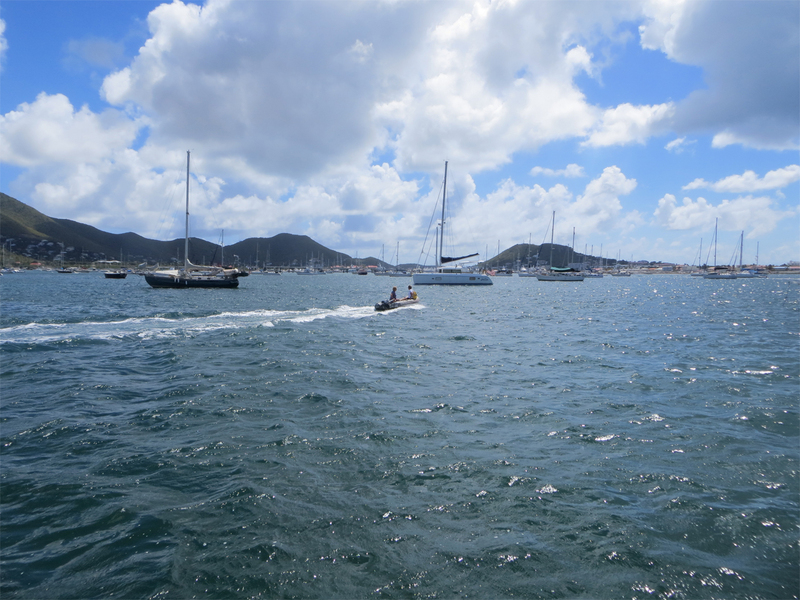 Unlike many places in the USVI and BVI, wifi is unavailable in the harbor other than through the 3G wireless network which requires a SIM card from the local telephone service. Since our stay here will be brief, we elect not to purchase a SIM card. Our only other alternative is to carry laptops ashore in the dinghy in search of free wifi spots at local bars, restaurants and patisseries. It is not unusual to see customers sitting in patisseries, staring into their electronic devices. 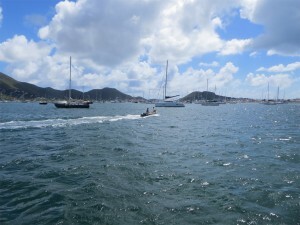 During trips ashore in the dinghy, there is always a threat of a squall and/or the danger of being swamped by the wake of a passing go-fast boat. It is difficult to insure the protection of our computers while in the dinghy. 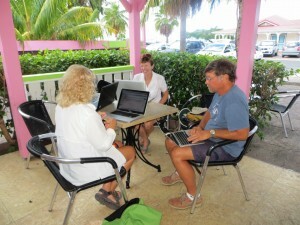 We visit wifi hotspots in Marigot only during settled weather. This explains, in part, why posts to this blog are less frequent than they have been in the past. It is Carnival week in Marigot. 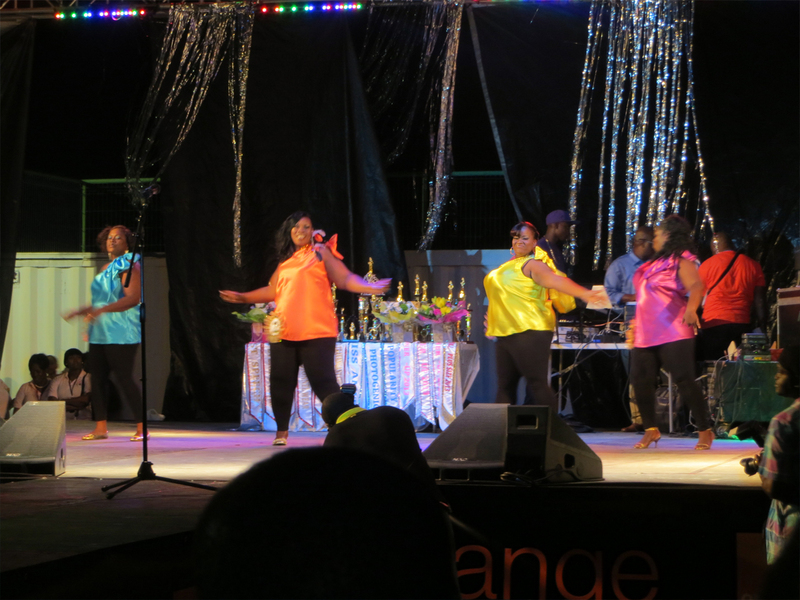 On Thursday, the attraction of the evening is the Miss Elegant Plus Size pageant at the town amphitheater. 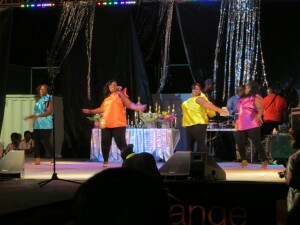 Before a panel of judges, four finalist contestants compete for the honor of being crowned Miss Elegant Plus Size Queen. In front of a wildly appreciative audience, each contestant is required to dance and strut across the stage before explaining why she is deserving of being selected Queen. This year, the crown goes to Ms. Jeanette Annicette who began her performance by dressing as a construction worker and being hoisted onto the stage by a truck with a hydraulic lift…not your typical beauty pageant. On Thursday afternoon, the anchor is up and Cutter Loose is on time for the 2:30 PM bridge opening at Sandy Ground on the French side. Regrettably, we must abandon the beauty of Marigot Bay with its turquoise water and tantalizing views of Anguilla to the north. The weather forecast calls for several days of 25 knot ENE winds and 12 foot northerly swells early next week. Since it is exposed to the north and northeast, Marigot Bay will become an untenable anchorage during the forthcoming period of unsettled weather. Accordingly, we have decided to move inland through the canal to the convenience and relative protection of Simpson Bay Lagoon. The Lagoon is a shallow, land-locked body of dark green murky-colored water covering 12 square miles. Inside, we are protected from ocean swells. 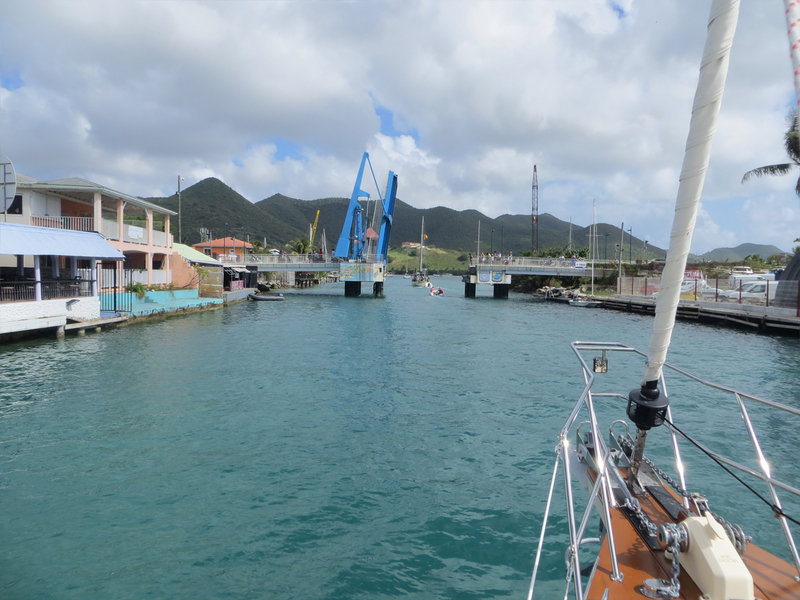 There is a well-established community of cruisers that live in the Lagoon year round. 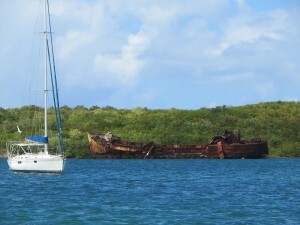 Most boats remaining in St. Martin for longer than a week end up anchoring in Simpson Bay Lagoon. All of the marinas and boatyards are located here. Some boats that enter the Lagoon never make it out. Some are here for the convenience of dinghying to marine services, foodstores, bars and restaurants. Some cruisers operate a business out of their anchored boat while others have secured local employment and commute to work via dinghy. Some boats are here seeking protection from unsettled weather. There are literally hundreds of boats at anchor in the Lagoon, some of which are sunken wrecks while others are derelict…victims of past hurricanes. Apart from the occasional wake from a go-fast boat, the water inside the Lagoon is usually quite calm. Princess Juliana Airport is located on the west shore of the Lagoon, providing a source of daily entertainment watching the big Air France Boeing 747s and other airships land and take off from this facility. Anchoring in the Lagoon is both a blessing and a curse. We appreciate the protection from wind and wave, but we prefer the pristine water and swimming opportunities of a secluded anchorage. Saturday’s plan calls for renting a vehicle to tour other parts of the Island. The next post will report on this and other adventures in paradise.